LIGHTNING almost struck twice at Allianz Stadium, but in the end the derby honours were shared. Almost three years to the day since Sydney FC retrieved a two-goal deficit to triumph over the Wanderers, fortunes swung nearly as violently this time around. 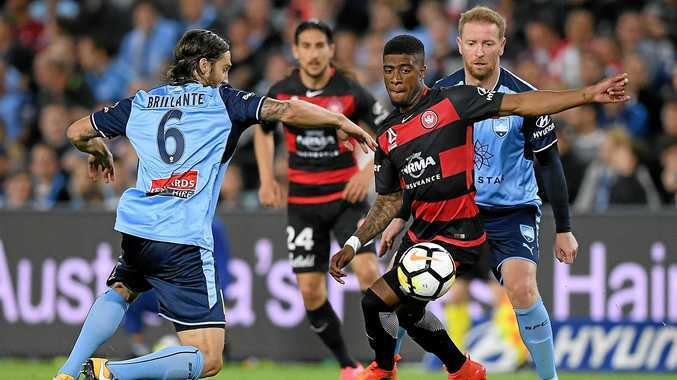 A 2-2 draw was a meagre return for Western Sydney after they had gone deservedly two goals ahead, but in the end the Sky Blue resilience would not be denied. Goals to Oriol Riera and Brendon Hamill had shocked the majority of the 34,810 crowd, before a Bobo penalty and Josh Brillante hauled Sydney level. If the crowd was disappointingly down on recent derby attendances, more fool those who stayed away for this was a humdinger. "I thought we were excellent, the response from last week's performance was really good," said Wanderers interim coach Hayden Foxe. "To come away from home, against the champions, from start to finish we were excellent. "We played some very good football. It's a good point away from home, but I thought the boys deserved all three points." Western Sydney had begun bristling with intent, hunting in packs without the ball and breaking at speed when they won it. Theirs was a hunger to behold: winning second balls, aerial battles and 50:50 challenges all over the park for much of the game. But Sydney fought tooth and nail to achieve parity, and in the end they could have won it themselves. "I told the boys at half-time, the mark of a champion team is to fight back," said coach Graham Arnold. "We gave away two terrible goals and we have to address the way we're starting games. But in the dressing room now there's disappointment because we had the better of the second half but we couldn't capitalise." Had Matt Simon not somehow headed wide in stoppage time, they would have capped the perfect comeback - but that would have been very harsh on the visitors, so well did they start the game. Their first incursion was quick and deadly: Josh Risdon bested Michael Zullo on Western Sydney's right wing and curled in a perfect cross for the glaringly unmarked Riera to glance home a header. From a defensive point of view it was a horrible lapse, but incredibly no lessons were learnt. On 31 minutes, after Roley Bonevacia had been upended by Luke Wilkshire, Alvaro Cejudo's freekick found Brendon Hamill free in the box to head in only his second A-League goal. At that point Western Sydney were utterly on top, but the success of last season has bred a confidence in Sydney that isn't easily dented. Still it needed some old-hand experience to get Sydney a foothold in the game. Six minutes after Hamill's goal, David Carney chased a pass into the Wanderers box then slowed up as Chris Herd chased him down. Unable to stop, Herd clattered into Carney and Bobo converted the penalty. If their equaliser on the hour was fortunate, Josh Brillante's shot deflected on its way past Janjetovic, Sydney's resolve in the end earned that stroke of fortune. Nothing could separate the teams ultimately, but already both look like title contenders.